1 of 4 Heat oven to 350 degrees . 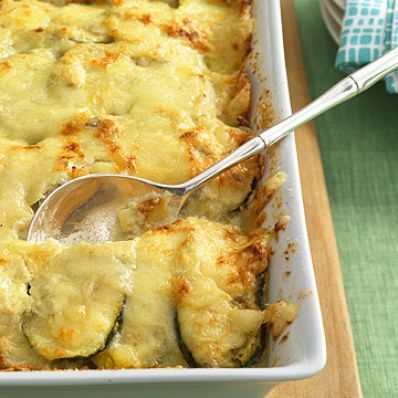 In large bowl, mix zucchini, yellow squash, 1/4 cup of the bread crumbs, sage, flour, 1 teaspoon of the salt, and pepper. In blender, puree artichoke hearts, scallion, 1/2 cup of the Swiss cheese, 1/4 cup of the cream, the remaining salt and a pinch of pepper. 2 of 4 Spread one-third of the squash mixture over bottom of a shallow 2-quart baking dish. Spread half of the artichoke puree over squash. Top with half of the turkey. Repeat layering; top with the remaining squash mixture. 3 of 4 Toss together the remaining 1 cup Swiss cheese, remaining bread crumbs and the Parmesan. Sprinkle evenly over gratin. Drizzle with the remaining 1/2 cup light cream. 4 of 4 Bake at 350 degrees for 50 minutes or until squash is tender and top is golden. Let stand 10 minutes before serving. Per Serving: 10 g sat. fat, 79 mg chol., 2 g fiber, 1039 mg sodium, 20 g pro., 299 kcal cal., 18 g Fat, total, 16 g carb.